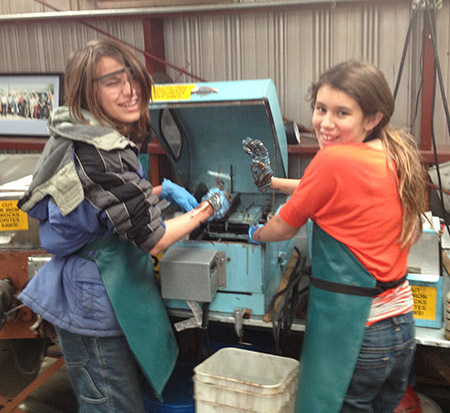 Saturday the workshop is open specifically for Junior members. We encourage juniors (and a parent) to join in the fun on the monthly fieldtrips. 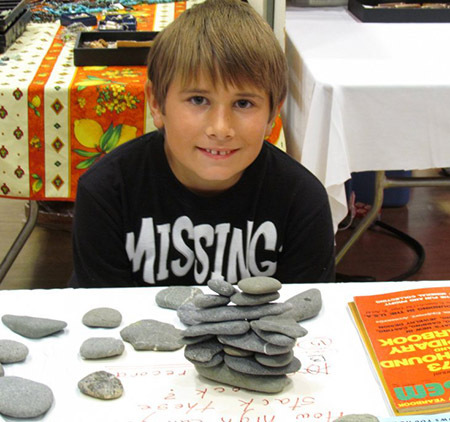 Our junior program will teach young people how to cut, grind, shape and polish rocks & then turn your polished rocks into jewelry! Learn how to identify rocks, minerals and even meteorites! Our Saturday workshops cover a variety of topics geared for Juniors. The Junior program is open to members between the ages of 8-17 years old. Membership fees can be found on the JOIN page. The SRMGS workshop is open to Junior's on Saturday's from 9:30 AM to 12:00 NOON. If your child needs additional supervision, we ask that an adult accompany the junior member to ensure the safety of your child as well as others. Badge meetings will be held on the first Saturday of each month! Calling all young rockhounds!! Are you ready for the challenge? Become a Rock superstar by collecting ALL offical AFMS badges. Each month your quest will be presented and your fearless leader will help you learn the skills & information needed to pass the challenge. There are over 20 badges including: Gold Panning, Lapiday Arts, Fossils, Earth Process, Mapping and more.. The Junior Rockhound Badge Progam is open to all SRMGS junior members (ages 8-17)- sign up with Jolene on Satudays at the rockshop!! Looking for additional resources and activities? Check out our Teacher Resource Page.